3M™ Scotchcal™ High Performance Striping Tapes create professional-grade accents and designs that enhance the appearance of vehicles. Made with a long-lasting vinyl backing, our tapes come with peel-and-stick adhesives that allows for quick and simple installation. 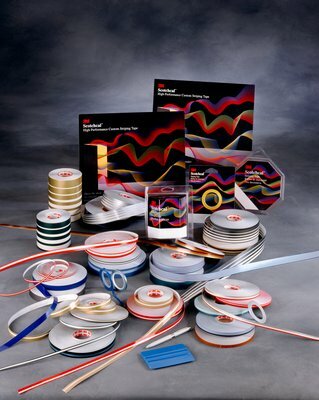 Our striping tapes are long-lasting, adhere reliably and resist fading over time. Customize the appearance of vehicles with 3M™ Scotchcal™ High Performance Striping Tapes. Our pinstriping tape gives added flare that makes cars and trucks strand out in the crowd. With an incredible range of colors, it's easy to customize the appearance of most any vehicle. Our tape is fully pigmented with resistance to UV rays to resist fading in the sun. Our adhesive is formulated to resist moisture, heat and cold for reliable adhesion in all weather extremes. Tough vinyl backing resists cracking, splitting or flaking in nearly any environment. Overall, our tape has excellent lasting power to satisfy the most discriminating automotive professional. Our striping tape creates clean lines without any harm to the vehicle's finish. It's a flexible tape that lays over the curves and contours of vehicles extremely well. Auto body technicians appreciate our tape for its ability to handle tight radius curves and excel at paint line definition. Peel-and-stick adhesive allows for easy installation. Be sure to clean the surface of the vehicle of any tars, grime or residue before applying. Just anchor the tape at a starting point and position as desired. If the exact position is not achieved at first, the tape may be gently lifted to reposition. Once the desired position has been achieved, apply pressure with your thumb or a squeegee to secure the tape to the surface. As an added benefit, our tape comes with an easy- to- remove transparent masking film to protect it during installation.